GRAYSTON Heavy Duty Spring Assisters have been developed for use on cars, off-road vehicles, vans, motor homes for towing, carrying heavy loads or LPG installations. GRAYSTON Spring Assisters are designed to suit vehicles with all types of suspension specifically cars with torsion bars, and when fitted keep the original driving comfort when the vehicle is unloaded, but also allow the vehicle to be driven in comfort and safely when it is subjected to constant and heavy load conditions. GRAYSTON Heavy Duty Spring Assisters are designed to set the spring rate of the vehicle to approximately 30% higher than the original. 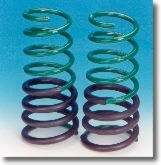 Pro Kits - Heavy Duty Progressive replacement springs GRAYSTON Pro Replacement Springs are progressive springs with a hardwearing and oil resistant rubber sleeve fitted. They give a 10% - 50% increase in spring rate, which automatically rises with the increasing load. With these Pro Springs fitted the vehicle retains its normal ride and keeps its original height when unloaded. Even when fully loaded the Pro Spring depress very little from the normal ride height. All Grayston kits are designed with the DIY motorist in mind. GRAYSTON Heavy Duty Spring Assisters are available in four systems as shown. TO UPRATE THE REAR SUSPENSION OF CARS, ESTATES, OFF ROAD VEHICLES, VANS AND MOTOR HOMES.